The world must hasten its economic decarbonization via energy transition to prevent the worst of global environmental catastrophes, said Germany’s leading climate experts, adding nuclear energy will be driven out by market forces. With the latest Intergovernmental Panel on Climate Change report urging the global community to take drastic measures to limit the increase in the Earth’s temperature to 1.5 degrees Celsius, moving away from fossil fuels is “inevitable,” stressed scientists Peter Hennicke and Detlef Stolten. They also emphasized that all countries must speed up their energy transitions to effectively implement the Paris climate agreement. “Time is running out, but it’s never too late. 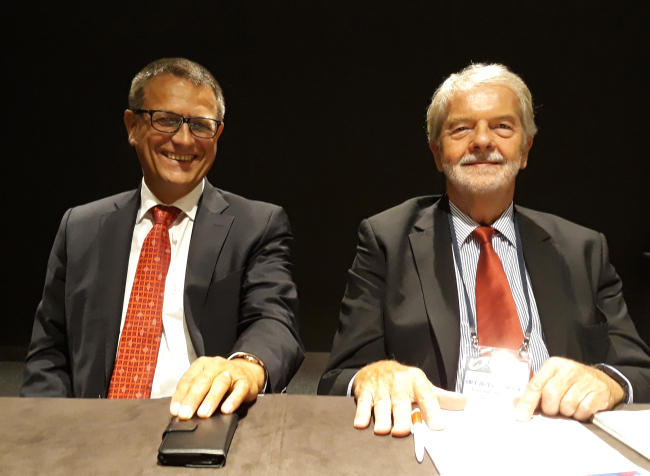 We are fast approaching the tipping point even with the internationally agreed 2-degree target,” Hennicke told The Korea Herald alongside Stolten at the Korea Energy Transition Conference at Coex in Seoul on Oct. 5. Hennicke is the former president of the Wuppertal Institute for Climate, Environment and Energy, a representative of the European Parliament in the European Environment Agency, and co-chair of the German-Japanese Energy Transition Council, which he launched. He is one of the architects of Germany’s “Energiewende,” or energy transition policy, and an internationally recognized expert in energy efficiency and policies. Stolten is the director of the Institute of Electrochemical Process Engineering at the Juelich Research Center in Germany and a chair for fuel cells at RWTH Aachen University. “While some people say ‘America First,’ we say ‘Climate Mitigation First.’ It is a global challenge we must solve together to speed up the process of energy transition,” Hennicke said. In Germany, he added, 36 percent of electricity is derived from renewables, and the national goal is to increase the share of renewables to 80 percent by 2050. Stolten said that developing long-term storage capacity for electricity is increasingly important, as renewable energies experience “peak demand” or “peak load” times at which electricity is produced at surplus. Peak demand fluctuations may occur on daily, monthly, seasonal and yearly cycles. Through a process of electrolysis, the surplus electricity can be converted to hydrogen, which can be fed into homes, cars or chemical plants, or be traded in an international marketplace. In Germany, Stolten explained, some 30 percent of power produced with renewables last year was surplus power. It was either used or converted into hydrogen and sold to the transport sector at competitive prices. Following the 2011 Fukushima nuclear disaster, Hennicke said, a national consensus has been reached in Germany on completely eliminating nuclear power from the energy mix by 2022. Stolten said the Fukushima disaster showed that safety standards of the nuclear industry must be upgraded, which inevitably lead to increased operating costs, while renewables increasingly become price-competitive. “No company in the world will insure a nuclear power plant. Market forces drive nuclear power out of the economy. Even some of the largest nuclear power plant producers nowadays incorporate hydrogen and renewable sources like wind,” he said. Hennicke pointed out that in Germany since the phasing out of nuclear power, a very dynamic process of research, technological innovation and corporate investment in renewable and alternative sources, such as hydrogen, has occurred. “It marked the start of a scientific, evidence-based strategy for energy transition,” he added.